[141 Pages Report] The global two part adhesive market (2015–2020) is estimated to reach USD 6.23 Billion by 2020 at a CAGR of 6.5%. The report covers the two part adhesive market by resin type, such as polyurethane, epoxy, MMA, silicone, and others; by application, such as automotive, construction, electronic, aerospace, and others; and by region, namely, North America, Europe, Asia-Pacific, and RoW. Base year considered for the study is 2014 while the forecast period is between 2015 and 2020. The two part adhesive market is driven by rise in demand of adhesives in bonding different plastics, composites, and different lightweight materials in the automotive, construction, & aviation industry. Both top-down and bottom-up approaches have been used to estimate and validate the size of the global market and to estimate the size of various other dependent submarkets in the overall two part adhesive market. The research study involved the use of extensive secondary sources, directories, and databases such as Hoovers, Bloomberg, Chemical Weekly, Factiva, The Adhesive and Sealant Council (ASC), Association of European Adhesives and Sealants (FEICA), Adhesive & Sealant Portal, British Adhesives and Sealants Association, Adhesives and Sealants Manufacturers Association of Canada, China National Adhesives Industry Association, The European Adhesive Tape Industry Network, Japan Adhesive Industry Association (JAIA), China Adhesives and Tape Industry Association (CATIA), Taiwan Synthetic Resins & Adhesives Industry Association (TSRAIA), Korea Adhesive Industry Association (KAIA), and other government and private websites to identify and collect information useful for the technical, market-oriented, and commercial study of the two part adhesive market. Two part adhesive are manufactured from various raw materials such as resins, binders, additives, wax, tackifier, and other ingredients. The raw material available in the market are supplied by major companies such as Dow Chemical Company (U.S.), Eastman Chemical Company (U.S.), Evonik Industries (Germany), Exxonmobil Chemical (U.S.) and others to the two part adhesive manufacturers such as H.B. Fuller (U.S.), 3M Company (U.S.), and Henkel AG & Company (Germany) and others. This research report categorizes the global two part adhesive market on the basis of resin type, application, and region. 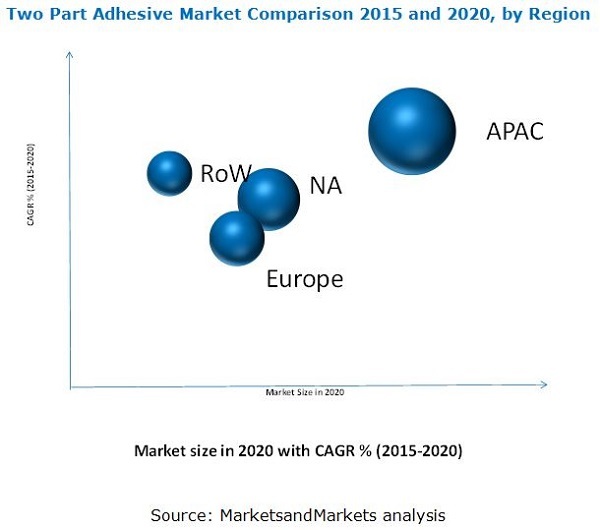 The two part adhesive market size is estimated to reach USD 6.23 Billion by 2020, at a CAGR of 6.5%. The market is driven by rising use of adhesive in the vehicles for weight reduction. As the automotive industry uses lightweight materials such as plastics, composites, and aluminum, which ultimately demand better adhesive material for bonding. So, it is a prime factor for the growth of two component adhesive, globally. Among all regions considered, Asia-Pacific and RoW are estimated to witness a strong growth in the next five years. Also, the demand across these regions is reinforced by the emerging markets, namely, China, Brazil, and India. According to applications, different types of adhesive based on different resins are generally used in the various industry. These have distinct properties as per the application requirements. These are classified based on their chemistries, namely, polyurethane, epoxy, MMA, silicone, among others. Furthermore, the others segment constitute of acrylic, polyimide and rubber based adhesives. Polyurethane adhesive is the current dominant type of adhesive in the two part adhesive market. Two part adhesive are used in various applications. Automotive, construction, and electronics, aerospace are the main application segments considered in the report. Automotive application witnessed the largest share of total adhesive, in terms of volume, and is also the highest growing application between 2015 and 2020. The drivers of the industry are growing demand of two part adhesive from automotive, construction and aerospace market. In automotive welds, fasteners, rivets, screws, gaskets, and joints are replaced with two component adhesives. The restraining factors are identified as volatility in raw material prices, government regulations and recessionary effect on the end-use industries. However, H.B. Fuller (U.S.), 3M Company (U.S.), and Henkel AG & Company (Germany) are the leading companies and with an excellent foothold in the U.S. and China. These companies are expected to account for a significant market share in the coming future. Entering into related industries and targeting new markets will enable the two part adhesive manufacturers to overcome the effects of volatile economy, leading to diversified business portfolio and increase in its revenue. Other major manufacturers of two component adhesive are Sika AG (Switzerland), BASF SE (Germany), Dow Chemical Company (U.S.), Bostik (France), and Master Bond Inc., (U.S.).